While you may think this is just a nice way to express your regret for the situation – no matter if you are to blame or not – it can be misconstrued and used against you down the road. The fact is, simply saying “I’m sorry” will make you look guilty and can actually be taken as an admission of guilt, which is something that can be used against you in court. Keep in mind, just saying the words I’m sorry may not be the only way that you admit your guilt for the accident. This can be used against you and ruin your chance to file a lawsuit down the road. It may even provide all the proof the other party needs to sue you for damages and injuries. 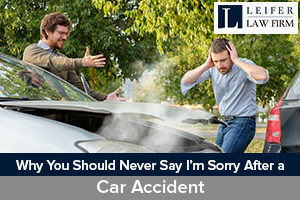 To be clear, and to make sure you fully understand, saying you are sorry or some other type of apology at the scene of any car accident isn’t going to mean that a judge will automatically believe that you are at fault. Also, in the state of Florida, there is no explicit legislation that incriminates a party based on who said the words, “I’m sorry,” at the crash scene. Even though stating an apology verbally will not automatically be considered evidence, or an official admission of your guilt, it still may make your car accident case much more difficult than it has to be. If you are involved in a car accident, you may be entitled to receive monetary compensation if the accident was someone else’s fault. However, you have to protect yourself and your right to recover these monetary damages. One of the best ways you can do this is by hiring a car accident attorney. They will be able to review the facts of your case, and let you know the steps you should, and should not, take to ensure you protect your rights. While there are some people who want to move forward without the help of an attorney, this isn’t always a good course of action. The law is complicated and without legal representation it can be impossible to prove your case and recover the damages that you deserve. If you find that you need the services of a car accident attorney in Florida, after you are injured by the fault of someone else, then call the team of attorneys at Leifer Law by calling (561) 440-8531.